Anita’s Reef is the perfect introduction to the Similan Islands. Huge coral structures with vibrant colours are home to a large variety of Marine life. Generally easy conditions make this one of the most popular Similan dive sites and a regular part of a Similan Liveaboard schedule. The life around ‘Hin Muang Diaw’ is a particular highlight for photographers. Anita’s reef runs from the rocky southern tip of Similan island five up to the bay between island five and six. The dive site is a collection of large, colourful coral heads dotted along a sloping reef. Anita’s reef contains one of the largest coral heads in the Similan Islands. ‘Hin Muang Diaw’ is a single hard coral structure over 10m in height. It is covered in soft corals and filled with life. Anita’s Reef is undoubtedly beautiful, but you will be left with one question. Who is Anita? Anita’s Reef is a relatively easy dive site and is likely to be the check dive on your Similan liveaboard trip. The large shallow bay plateaus at around 8m. The gently sloping reef has lots of marine life all the way down to 30m. Currents are usually mild (if any at all). If there is current around full moon, the dive simply transforms into a relaxing drift dive. Anita’s Reef is the perfect place to try diving in the Similan islands. It has the fairly unique combination of easy conditions in a shallow bay, with lots of healthy marine life, and hundreds of species of fish and coral. If you have never tried diving in Thailand before, this is an excellent place to start. Anita’s reef is a dive site for all ages and experience levels. ‘Hin Muang Diaw’ is always worth a stop, but there are less explored areas. Stay shallow until you reach the coral head and spiral down. Keep diving deeper to reach another coral head at around 28m. There are less divers, more stingrays and a huge field of Garden eels. If diving on nitrox, stay deep and head south past some large sea fans, and out to the boulders. ‘Hin Muang Diaw’ is the Thai name for one of the largest and most colourful coral structures in the Similan islands. It literally translates as ‘Whole roll rock’. This refers to days before digital underwater photography. It implies you can use a ‘whole roll’ of camera film on this single rock. Towering from the deepest point at 23m, all the way up to 12m, it is one massive coral head densely covered in soft corals. It creates a perfect habitat for smaller critters. With a plethora of marine life to search for, Hin Muang Diaw is the highlight of Anita’s Reef. It is beautiful from top to bottom. A shallow plateau leading to a gently sloping sandy bottom. Sporadically placed coral heads and sea fans are all over the dive site. Large granite Boulders appear at the Southern tip. A well protected bay with mild currents and typically great visibility. If strong winds or large waves approach from the East, it is preferable to dive on the West side in Hideaway bay. Excellent for both macro and wide angle photography. Consider a multi-level dive around ‘Hin Muang Diaw’. The electric pink anemone at 12m is (almost literally) the cherry on top. In the peaks of high season Anita’s Reef can get a little bit busy. Hin muang diaw in particular draws a lot of attention. The easiest way to avoid this is to spend more time exploring the smaller, but equally lively, coral structure to the north. You can also spend more time exploring the boulders in the south. Alternatively, sometimes it can be worth doing this dive a bit later in the day. Most Similan Liveaboards visit Anita’s reef for their check dive. Anita’s Reef may be busy at 7am, but often becomes completely deserted by 10am. This is likely to be the check dive on your Similan Liveaboard. Spend the first part of the dive in the shallows to the East of where Similan islands five and six meet. This large area is usually calm and has a depth of between 5m and 9m. Stay here for around 10 minutes to check that everyone in the group is comfortable and relaxed. At the edge of this bay the sand begins a gentle slope down to 30m. As you dive deeper you will see many large coral structures sporadically dotted around the sandy bottom. Inside these coral colonies are moray eels, lionfish, nudibranchs and many shrimp. Keep your eyes open as you pass over the sand to find a multitude of creatures hidden inside. Anita’s reef is a popular site to see garden eels poking their heads up out of small holes in the sand. You can also find Kuhl’s stingrays out deep. Keep heading south to get to ‘Hin Muang Diaw’; the largest and most colourful coral head in the Similan islands. It starts at 23m and towers all the way up to 12m. Surrounded by soft tree corals, sea fans and covered in glassfish. It is well worth spending some time here. It is sometimes even possible to find rarer marine life here including ribbon eels and ghost pipefish. For Thailand diving, Hin muang diaw is one of the best places for underwater photography. You can stay here for the whole hour, doing a multilevel dive, or you can continue on. On the southern tip of Similan island five the dive site changes into impressive rock formations. This area of the dive site has very different marine life because of the harsher conditions and stronger currents. There you can find different hard corals and larger fish. Look out into the blue as it has been known to see Manta rays passing by the island. If you would like a more challenging dive you can begin at this rocky southern tip. Huge granite boulders sitting at 30m are a great place to find Kuhl’s stingrays. Large predators like Tuna and Trevally are often found hunting around the top of these rocks where there is a bit more current. Other areas to dive around Similan island five include the tuna wreck to the West (28m to 40m) or the tsunami memorial statues sitting in the sand to the North (10m). Here is where you may be able to find Anita’s statue! There is a huge variety of marine life to see around Anita’s reef. It is a great place to start your Similan liveaboard because of its relative ease. Day trips are sometimes possible to this dive site, but usually not every day of the week. 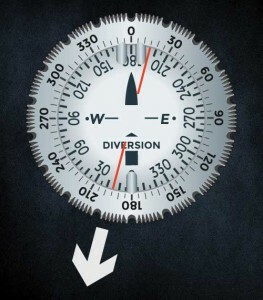 Use this route at times when there is no current or during a falling tide. Jump in the shallow bay between Islands Five and Six. Head North-east towards the sloping reef and descend to 18m. Turn South-east and swim parrallel to the reef. Head towards ‘Hin Muang Diaw’; the dive site’s largest and most impressive coral structure. From Hin Muang Diaw, just keep swimming on this compass heading to the granite boulders in the southern portion of Anita’s Reef. Shallow up to the rocky southern tip of Similan island five. Beware not to swim round the other side of the island as it may be difficult for the crew to see you surface. So, who is Anita? Anita’s Reef is likely to be the first dive of your Similan Liveaboard trip, so there is something you should know about the Similan islands dive sites. Any Thailand diving holiday will confront you with many confusing dive site names. One dive site may have several names and different explanations as to where the name came from. Anita’s reef is a perfect example. Anita’s reef is sometimes referred to as ‘barracuda point’ or the Thai name ‘Hin muang diaw’. Some people refer to dive sites by the island number and other dive shops come up with their own unique names just to confuse matters. Even though most people use the name ‘Anita’s reef’, we are yet to meet anyone with a good explanation of who Anita was. It seems to be quite easy for fallacies to spread around the diving community. What starts life as a vague story, lacking in detail, soon becomes a well known ‘fact’. So, at Scuba Diversion, we have our own ‘facts’! Lets see if they stick. Most of what follows is true, but not all. Just round the corner, on the west of Koh Haa (Similan island five), is a dive site called hideaway bay. This has several interesting features. There is a sunken fishing boat called the tuna wreck and 12 statues representing the Chinese zodiacs. The statues were placed there as part of a tsunami memorial. Finally, there is a mermaid meant to bring you good luck on your Similan diving trip! There is a statue of a naked woman that has slightly broken up and now lies semi hidden by the corals. She has become know as ‘the mermaid of the Similan islands’. This is a strange sight if you are not expecting it. It has become custom for divers to put their hands on her chest and give a little squeeze. This is meant to give you good luck in the search for Manta Rays on your Similan liveaboard trip. We have tried squeezing several times. Results have been inconclusive. So who is Anita? We like to think of her as the mermaid of the Similan Islands. Anita; the stone mermaid, is an unusual sight to see first thing in the morning. We don’t know how long she has been down there but an encounter with her can bring you good fortune on the rest of your Similan Liveaboard trip. However, in the true spirit of Similan Island dive site names, the myth behind Anita the mermaid is probably not true. There are many examples of legends and myths becoming general common ‘knowledge’. There is one even more incredible example of folk lore around the Similan Islands. 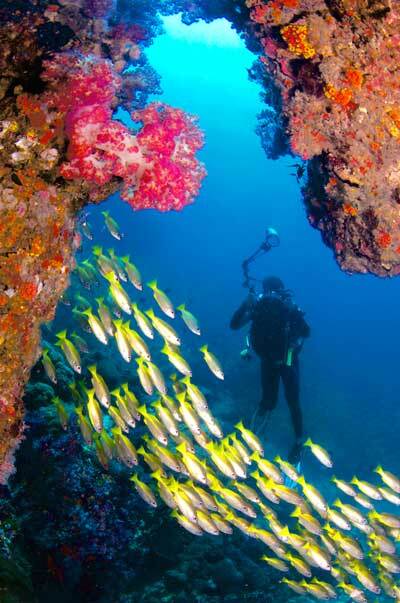 Click here to take a look at Thailand’s most famous dive site; Richelieu Rock.